Barcelona's Lionel Messi, left, celebrates after scoring the second goal. 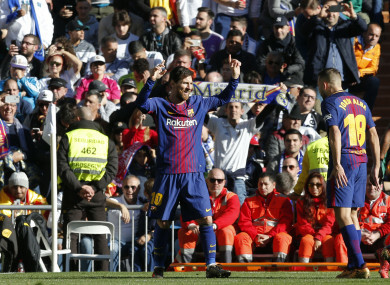 BARCELONA TOOK A huge step towards regaining the La Liga title as goals from Luis Suarez, Lionel Messi and Aleix Vidal beat bitter rivals Real Madrid 3-0 at the Santiago Bernabeu on Saturday to open up a 14-point lead over the European champions. And Barca put the seal of a stunning victory in stoppage time when Vidal drove Messi’s cut-back towards goal and the ball squeezed in under Navas. Email “Messi and Suarez inspire Barcelona to historic El Clasico win over 10-man Real”. Feedback on “Messi and Suarez inspire Barcelona to historic El Clasico win over 10-man Real”.